Ouabache Land Conservancy protects land by owning nature preserves and by holding permanent conservation easements on privately-owned land. OLC now protects 6 properties totaling over 600 acres—all made possible by the generous support of our donors and volunteers. 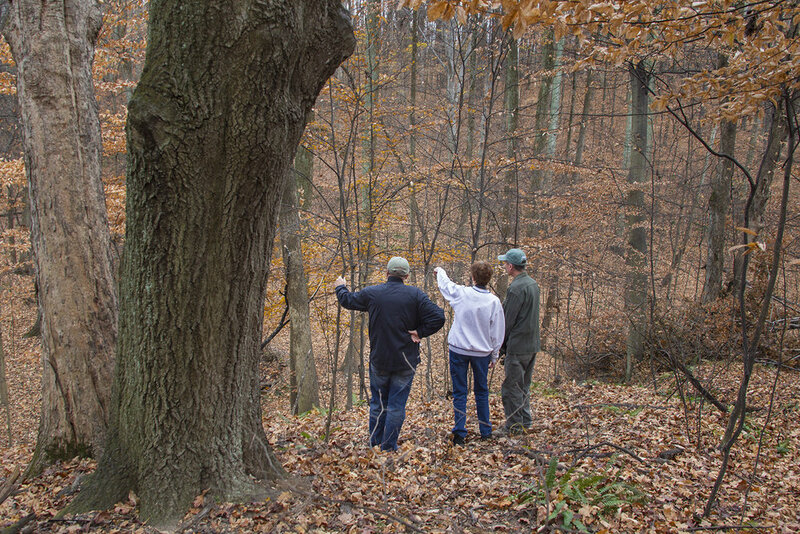 Ouabache Land Conservancy is enthused to announce the acquisition of a beautiful 27.9 acre woodland in Parke County. The property was originally settled by the Sciurba Family in the 1920’s. They had emigrated from Italy passing through Ellis Island and then settled on the property in Lyford Indiana. During the depression the family was forced to move to Chicago to find employment. Since that departure the property has had no human presence. One of the granddaughters has continued to maintain payment of the taxes and any other incurred costs of ownership. When approached by OLC with our desire to purchase for preservation, she said “This is the phone call I have been waiting for forty years.” A purchase price was arrived at and after several months of legal procedures the acquisition was completed on May 29, 2015. OLC is proud to add the Atherton Island Natural Area into the protected properties of West Central Indiana! Thanks to the generosity of Dr. Jim and Joy Nardi 80 acres of beautiful upland woods and tallgrass prairie (site of the former Nardi Orchard) was added to the previously protected area of Atherton Island Natural Area (December of 2017) for a total of 108 protected acres. Currently Atherton Island Natural Area is only open to the public on special hike and volunteer work days. The Jackson/Schnyder Nature Preserve was donated to the OLC in Spring of 2010 by its namesake, Dr. Marion Jackson, Professor Emeritus from Indiana State University. This easement is on 15 acres of bottomland hardwood forest along a tributary to Lost Creek in eastern Vigo County and is owned by Craig and Carole Reynolds. It's a very good habitat for many birds and other animals that visit and live in the nearby Hawthorn Park & J.I. Case Wetland Wildlife Refuge. In 1998 The Reynolds were able to purchase and therefore save this property, and the wildlife that inhabit it, from developers. This easement is on the Bob and Joanne Haymaker Farm, which consists of 161.23 acres lying along the Little Walnut Creek in North Western Putnam County. The Ouabache Land Conservancy is honored to announce that as of December 14, 2016 a Conservation Easement (CE) consisting of a 122.96 acre parcel of property located in Fayette Township, West Terre Haute, Indiana has been accepted. This CE is an addition to the 248 acre property that OLC currently holds a CE on owned by James McDonald and family. The property will be given the same consideration that the existing contiguous 248 has in place with woodlands, wetlands, wildlife food plots, and natural habitat all protected. This now is a nice large block of 371 acres of property protected from development. Our great appreciation goes out to the McDonald family for allowing OLC to hold this CE for future generations!